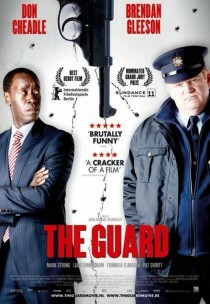 In this lovely little comedy set in Ireland, Brendan Gleeson plays an unorthodox rural garda (policeman) who has to team up with an FBI agent (Don Cheadle) to catch some international criminals. The mismatching of these two coppers from very different backgrounds makes for a funny and warm movie with a tiny bit of action thrown in. Wonderful Cinema would ask you to watch out for unrealistic expectations before watching The Guard. In our opinion, marketing campaigns making bold statements such as “A Raucous Comedy!” only serve to prepare the consumer for disappointment. This is a thoroughly entertaining film but crying with laughter for 96 minutes you will not. You can find more information on this Irish film on Wikipedia and IMDb. Love all of Don Cheadle films. He has always played such strong serious parts. It is going to be interesting seeing him in a comedy. This film made me wee myself slightly, and it gets better with each sitting. Truly genius.